The United States has seen its share of recessions in its 242 years as a country, but none quite compares to the Great Depression and the financial devastation it left in its wake. The Great Depression is said to have lasted from 1929-1941, though some also say its true end was at the end of World War II. It is seen as the greatest financial catastrophe of the entire 20th century, the only event even approaching its disastrous nature being the Great Recession of the late 2000s. How could such a monumental collapse of the economy occur? As a massive recession that devastated the country (and subsequently the entire world), it's hard to pin down one single fault for the Great Depression. It was a number of factors all coalescing into more than a decade economic misery. There are several theories as to how the economy was able to collapse, but the most obvious occurrence that portended doom and started the depression was the stock market crash that happened in October of 1929. 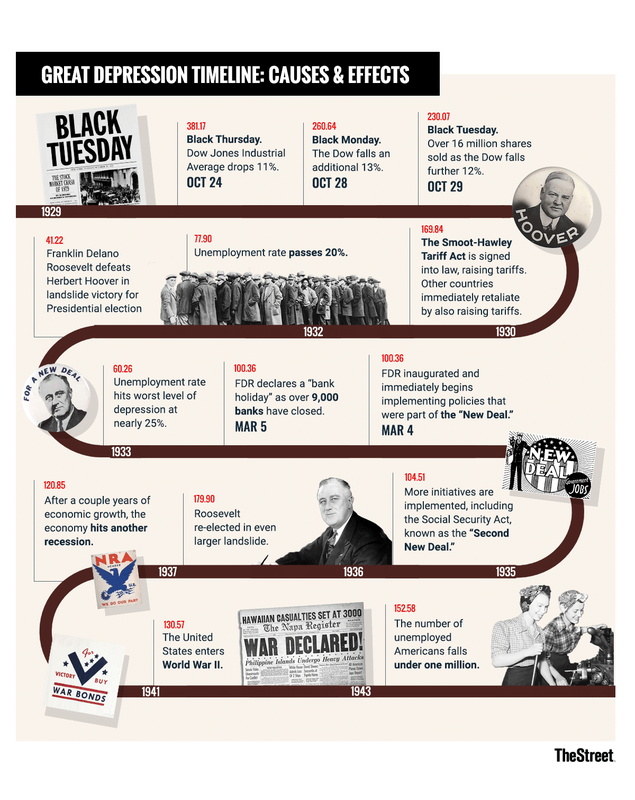 Oct. 24, 1929 became known as Black Thursday. Early on that day, the Dow Jones Industrial Average dropped 11%. Panicked investors began selling their shares in an unprecedented volume; the Dow had been gradually declining since its peak in early September of that year and investors feared the worst. Black Thursday wasn't the worst, though. That Thursday the Dow closed at 299.47. On October 28, known as Black Monday, it fell 13% to 260.64. Further panic set in, and the next day - Black Tuesday - the market fell even further. Pandemonium ensued on the New York Stock Exchange, and nothing was able to stop the panic and immediate impulse for investors to sell their shares lest it fall further. Over 16 million shares were traded that day, and the market fell another 12%. On that Monday and Tuesday alone, over $30 billion in share value was lost. The Dow would continue to decline for 3 years in the wake of these three disastrous days. Confidence in the economy was shattered. Wall Street and the banks were no longer seen as reliable. Many refused to put money into stocks, choosing instead to buy gold. Of course, a stock market crash doesn't just happen on its own, completely out of nowhere. There were several problems with the economy that many didn't see and others ignored. One major economic issue of the time is one that still greatly affects America today: Income inequality. Research from UC Berkeley professor Emmanuel Baez suggests that Americans in the top 1% of income in 2012 had the highest percentage of the nation's income since 1928. In 1928, the top 1% made a whopping 19.6% of the nation's income. Economic growth would inevitably stall. The Roaring Twenties meant great employment numbers throughout the decade as industries expanded rapidly, but the wages of workers did not increase to the same degree that corporate profits increased. Products were being made, but many were no longer able to afford them. Spending slowed, playing a part in stock prices declining. Tariffs. Sound familiar? The Smoot-Hawley Tariff Act was first introduced to Congress in 1929 and became official law in 1930 after the stock market crash. This act was meant to help protect America's farmers from overseas competition by putting in a protectionist policy, but it backfired tremendously. The tariffs were warned against before being signed into law, immediately unpopular, and were quickly retaliated against. Other countries increased their tariffs as well, and trade between nations plummeted for several years. The fallout from the Smoot-Hawley Tariff Act hurt not just the U.S. but the world economy, and may have made the depression worse. Some economists believe, in hindsight, that some decisions made by the Federal Reserve played a role in the economy worsening, former Federal Reserve Chairman Ben Bernanke being one. Some have even argued that the Fed is the reason it became a depression at all, and that had they been more active and aggressive, it could have been held to a recession. The Federal Reserve did not give aid to banks and thousands of smaller ones collapsed, in part because the Fed declined to create more cash as the money supply tightened. This was far different than the Fed of the Roaring Twenties, which increased money supply plenty throughout the decade. For many years, as one economic malady after another befell the country, American citizens were left in awful conditions, with poor jobs and wages. Many no longer had savings. A severe drought struck the Southern Plains, causing the infamous Dust Bowl. This meant many U.S. farmers, in addition to being hurt by the tariffs and trade decline, no longer even had usable land for farming. What were some of the other major effects that happened in the wake of the Great Depression years? As mentioned earlier, wages for a lot of workers weren't exactly high right before the depression. With banks unable to provide savings for people and companies falling apart, unemployment levels rose to worrying rates. The Great Depression started with the unemployment rate rising, but still under 10%. As the depression reached its nadir, though, it worsened significantly. It blew past 20% in 1932 and by 1933, it was approximately 25%. The unemployment level never hit quite as dire a level for the remainder of the depression, but the rate was still over 10% until the early '40s, when the U.S. entered World War II. After the market crash, confidence and belief in the U.S. financial system was practically nonexistent, and that affected banks greatly. Many Americans began pulling what money they had left out of the banks, preferring to hoard it or buy gold instead. Bank accounts were being withdrawn en masse, and the banks did not have the cash on hand necessary to cover all withdrawals. Bank runs like these are done by depositors in the hopes of getting their money back before the banks completely collapse in a worst-case scenario; in this case, the worst-case scenario became real life and over 9,000 banks failed. The result was billions of dollars that bank depositors were not able to recoup. It would be difficult to pin an economic collapse on one single figure, but as president during the stock market crash, the Smoot-Hawley Tariff Act and 9,000+ banks failing, Herbert Hoover was a pretty easy figure to point at. As the face of a country in major turmoil, Hoover had an uphill battle for re-election and was defeated easily by Franklin Delano Roosevelt. Roosevelt campaigned on change, and after a Hoover administration of depression, the American people were ready for it. There are multiple theories as to what ended the Great Depression, one of which is that when Roosevelt entered office, he immediately began implementing policies that were part of what would be known as the "New Deal." The first New Deal focused on economy, the banks and farmers in an attempt to strengthen them at their weakest. The Emergency Bank Act attempted to stabilize the banking system after thousands of failures, while the Agricultural Adjustment Act and the Emergency Farm Mortgage Act aimed to save farmers, their farms and their crops. After a couple of years of passing initiatives to help save businesses and industries, in 1935 the "Second New Deal" began. 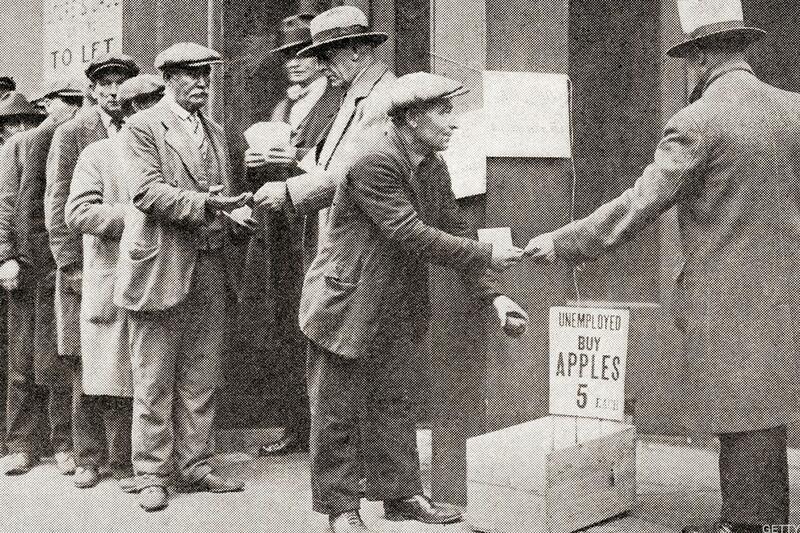 These initiatives sought to help poor, unemployed struggling Americans. Some programs continued to help farmers, even paying them to plant specific crops. Perhaps most importantly, though, the Second New Deal implemented the Social Security Act. These programs, and the many others that FDR would go on to implement, stimulated the economy and helped lower the unemployment rate. Still, some say that it was instead World War II that ended the Great Depression. Government spending went up significantly when the U.S. joined the war, and unemployment dipped below 1 million unemployed Americans. American soldiers returned home to an economic boom. The Great Depression lasted over a decade, though the worst of it was from 1929-33. The New Deal policies steadily helped lead the economy back - albeit with a brief recession in 1937. The years of the Great Depression presented great turmoil for the country and the world. After that struggle, lessons had to be learned by the government and the Federal Reserve on how to avoid letting a recession turning into a depression of that magnitude ever again.